Operator profile contains all personal information about the operator: name, nick name, email, picture, greeting message, font, login and password, list of assigned departments, etc. You can create any number of operator profiles during the trial. When you purchase a subscription, the number of operator profiles should be adjusted according to the subscription. If you wish to have a personalized profile for each operator, you need to have as many operator profiles as there are operators in your company. You can also create generic operator profiles and share them between several operators. Each operator can have as many concurrent chats at a time as they can handle, we don't limit this, it will only depend on your operators. 2.Fill out all needed fields on the New Operator Profile page (Note! Fields marked with * are required). Please also note! Operator login and Nick Name should be unique. Operator login can contain only Latin letters and digits. Other characters except underscore and dash characters are disallowed. Operator password can have no less than 5 symbols and no more than 20 ones. Operator picture will be displayed in the top left corner of the Visitor Chat Messenger. You can choose operator picture from our gallery, upload your own picture or completely delete the picture. The picture should be GIF or JPEG image up to 512x512 pixels in size. If the uploaded image exceeds the maximum size allowed, it will be scaled to fit the limits. Most part of operator pictures in our gallery are 96x96 pixels in size. Note! Please, do not check "Delete existing picture" box if you don't want to completely delete the operator picture. 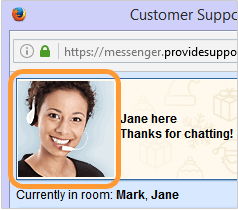 Operator greeting message will be displayed to the right from operator picture in the Classic Chat Window. The greeting message supports basic HTML formatting. This greeting message is not displayed in Modern Chat Window. By default the greeting message for all new operators is "You are speaking<br/>with Customer Service and Technical Support operator"
Each operator profile can be assigned to as many departments as you need. There are no special administrator operator profiles in our system but there's a workaround: you as the account administrator can login to any operator profile from your computer and see all current chats. You can have several operator consoles running on the same computer if needed. You can see all current visitors if you login as operator and set up your operator console to Away status – for your website visitors it will look as if the chat is offline. If you require creating a big number of operator profiles, it is possible to upload them in bulk from a CSV file. You can download the template and use it for adding your operator profiles. •several department names, separated by a comma - if you'd like to assign your operator to several departments. 9.Operator picture URL. Here you'd need to add a link to your operator profile picture or leave this field blank if no picture should be used for your operator profile. 4.Maximum allowed size for the operator picture is 10 MB. The following formats are supported: gif, png, jpg, jpe.